The Simple ToPCAT Roughness Tool takes in a raw point cloud file as input and outputs a surface roughness raster. 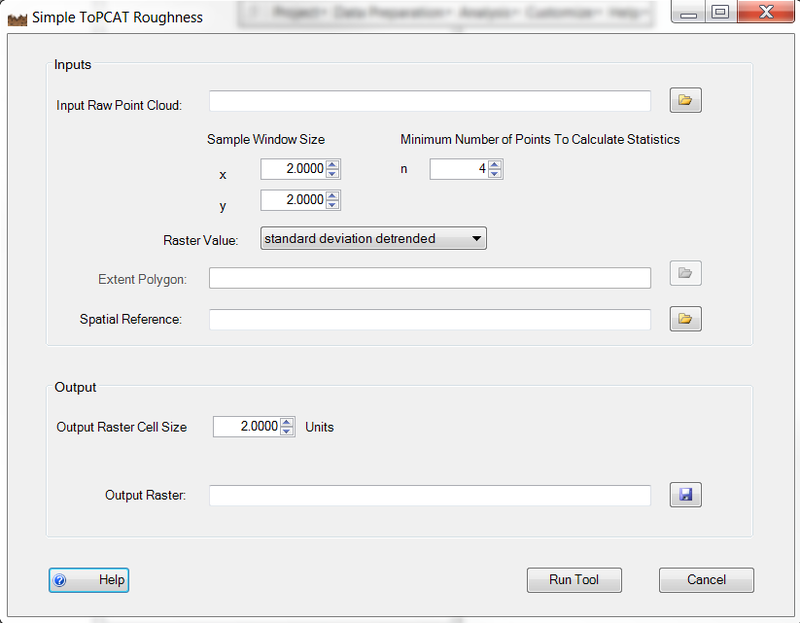 To do this it leverages ToPCAT to decimate the point cloud file and calculate the locally detrended standard deviation based on the elevation values in the user defined sample window and minimum points to calculate statistics. The output surface roughness model can be used as i) a roughness height model, ii) a metric of uncertainty (where roughness is predominant component of uncertainty), and/or iii) an input to a fuzzy inference system surface uncertainty model. formatted into space delimited columns of x,y,z. Dimensions in units of the raw survey file to define the size of the sample window used to calculate statistics from. To calculate many of its output statistics multiple points are needed within a sample window. The default minimum number is 4 points. When creating a surface roughness raster the user should use the default value of standard deviation detrended. can be in the form of a .prj file or you can load an existing shapefile that contains a spatial reference and that spatial reference will be imported. raster whose values are the locally detrended standard deviation of the cell. *If a user selects a different value from the Raster Value drop-down menu, the value selected from this drop-down will be used to create the output raster.